Upon arrival at Beijing Airport, please clear yourself through customs. Our English-speaking guide will meet you at the arrival hall, after which we will drive you to the hotel. Have a good rest to restore yourself for the following 16 days China tour. Or, you can take a short walk around on your own. After breakfast, your guide will offer a brief introduction to the group. 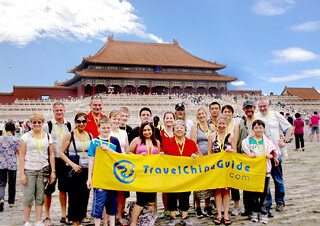 The morning excursions will be the famous Tiananmen Square and the Forbidden City. As a palace for 24 emperors during the Ming and Qing dynasties, it has a mysterious aura. An a la carte welcome lunch (valued at CNY150.00 per person and included in our price) at a nicely decorated and noted local restaurant will follow allowing you to taste diversified Chinese food and Peking Roast Duck. In the afternoon we will visit the Temple of Heaven, a delicate ancient architectural complex where emperors once offered sacrifices to the God of Heaven. Later, we'll lighten up the evening with an exciting Chinese Kung Fu Show at the Red Theatre. No Beijing tour is complete without visiting the Great Wall. This morning, we will set off to the suburban Mutianyu Great Wall. The cable car will take you up and down since it is an energy-consuming climb. The most important thing for you is to enjoy walking on the wall and appreciate the amazing wonder. 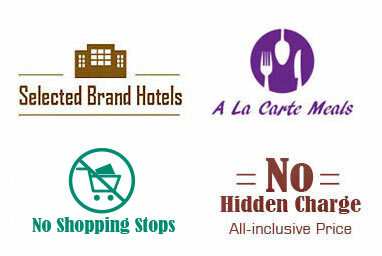 The restaurants nearby offer poor meals that do not meet our service standard. We therefore suggest you have a sufficient breakfast at the hotel and have some fast food for lunch by yourself. Get back to Beijing in the afternoon and have a photo stop in the Olympic sports venue, the National Stadium (also the Bird's Nest). The remaining time of the day will be arranged for you to explore a traditional local market. After that we will drive you back to the hotel. For first-time visitors, the Summer Palace, a former imperial summer resort, is one venue you should not miss. It is the largest and best-preserved imperial garden as well as a world-famous tourist resort. The next stop is the Hutongs. 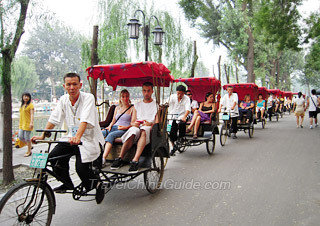 It is fantastic to experience the area by rickshaw and get an insight into the old Beijing culture. You will also have a chance to try your hand at Chinese Paper Cutting. A la carte lunch (valued at CNY150.00 per person and included in our price) will be scheduled at an elegant local restaurant. After lunch, you will be transferred to the airport for your flight to Xi'an. Our professional guide will meet you outside the baggage claim area of the airport and transfer you to the hotel. 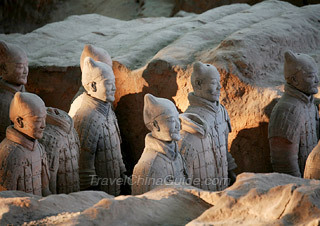 We will visit the amazing Terracotta Army this morning to appreciate the undeniable excellent ancient craft works of the Qin dynasty. The site mostly has cheap tourist restaurants nearby, so we would like to drive you back to the city center to have a real home-cooked a la carte lunch (valued at CNY120.00 per person and included in our price) at a local family home. 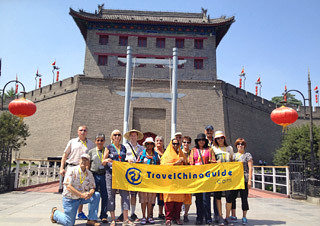 After lunch, a visit to the Small Wild Goose Pagoda & Xi'an Museum is scheduled. Also a delicious dumpling dinner will be served tonight along with the Tang Dynasty Music and Dance Show. The City Wall Park is a good place to experience more of the local Xi'an lives, so today your first stop will be spending some leisure time in the park. We also have a special arrangement for you here. That is learning to practice Tai Chi with a master. Then ascend the ancient City Wall and have a panoramic view of the city while strolling on it. The brick road on top of the wall is broad and you can rent and ride bicycles for fun if you like. Around noon, enjoy an a la carte lunch (valued at CNY120.00 per person and included in our price) at a famous local restaurant. In the afternoon, we continue to visit Shaanxi History Museum and the Great Mosque. On the Muslim Street where the mosque is located you will also find delicious Muslim food and interesting souvenirs. Catch a morning flight to Guilin. Upon your arrival, our guide will meet you outside the baggage claim area. Your Guilin sightseeing starts with the famous Reed Flute Cave, which is a 240 meter karst cave that has various shapes of stalactites and stalagmites. Then we head to the Elephant Trunk Hill. The shape of the hill is just like a giant elephant boozing water from the river with its long trunk, hence got the name. After that, we will transfer you to the hotel. After breakfast at the hotel, we drive to the pier to appreciate the picturesque scenery of Li River by cruising down from Guilin to Yangshuo. As the lunch on the ship is the basic Chinese box lunch, it cannot be up to your taste, we suggest you have a big breakfast at the hotel this morning. Disembark at Yangshuo in about 4 hours, you will take a stroll on the famous West Street. 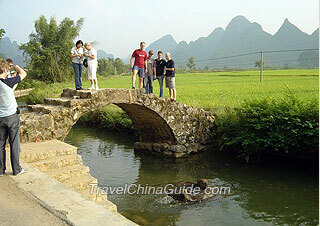 Then we transfer you to enjoy the countryside scenes of rural Yangshuo. 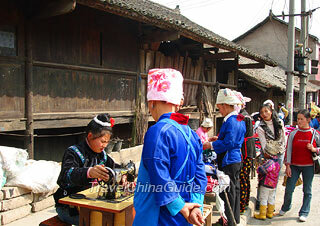 On the way, you also have a chance to visit a local peasant home and get a close touch with the country life. Finally, we drive you back to Guilin. After breakfast, catch a morning flight to Chengdu. Upon your arrival, our guide will be waiting for you outside the baggage claim area and transfer you to the hotel. We will leave you free time for lunch and rest for the remaining time of the day, and our guide is glad to offer advices of nice restaurants. Today we will have a pleasant date with China's national treasure giant pandas at the Research Base of Giant Panda Breeding. The pandas are very active in the morning. 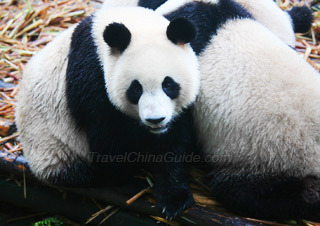 You will sure be entertained when you see the cute and chubby panda bears eating bamboo shoots or playing with each other. Then, continue to the Broad and Narrow Alleys where old houses and alleys of the Qing Dynasty have been turned to tea houses, restaurants, shops and bars. Lunch is arranged on your own. You might try some local snacks in the alley or choose a courtyard restaurant to enjoy your lunch. In the afternoon, visit Jinsha Site Museum, a significant relic of the ancient Shu civilization discovered in 2001. The Gold Sun God Bird unearthed from the site has been selected as the logo of China Cultural Heritages. After the museum, you will come to the most popular Renmin Park. Have a pot of tea there and live like a local. We remain the whole morning free for you. You can take time to explore this pleasant city further and have lunch by yourself. In the afternoon, our guide will drop you off at the railway station and help you board a bullet train to Chongqing. It is a two hours trip. Upon your arrival, our guide in Chongqing will meet you at the station. Explore Jiefangbei CBD and Ci Qi Kou Ancient Village, where you may have dinner by yourself. Tonight, you will board a 5-star Yangtze cruise ship, which sets sail at 21:30. The ship arrives at Zhongxian at about 14:00. We will disembark and visit the Shibaozhai. The onshore visit will enable you to witness the majestic and delicate wooden tower along with the giant rock. The unique tower, first built in Wanli reign of Ming Dynasty, is regarded as a fairy land in Yangtze River. Re-embark and continue the cruise. This evening, you will be invited to join in the Captain's Welcome Party. Have fun! 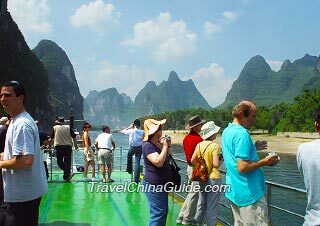 In the morning, the ship will reach Qutang Gorge and Wu Gorge. The cruise guide on-board is expected to make a formal presentation. Get your camera ready! After lunch, we will disembark to experience an interesting excursion to the Shennv Stream by boat which will add much joy to the marvelous day. It lasts 3 to 4 hours. Back to the ship and cruise down the western section of Xiling Gorge. The Three Gorges Dam, the world's largest hydro-electric project is your last excursion stop on Yangtze. Pack your belongings for disembarking before the visit. 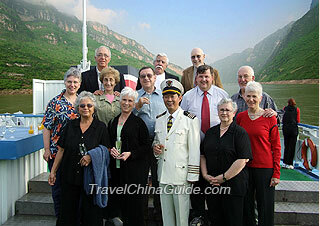 Afterwards, the cruise ship company will drive you to the Three Gorges Tourist Center and our local guide will meet you there. 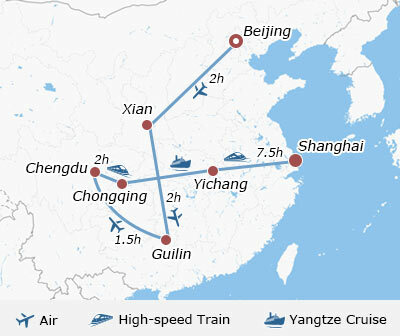 Then you will be taking a bullet train to your last scheduled destination, Shanghai. It is a 7.5 hours trip. 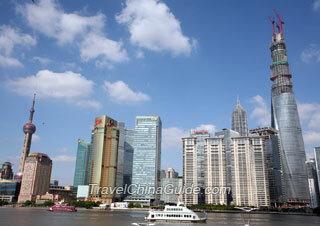 On arriving at Shanghai railway station, you will be met by the guide and transferred to the hotel. After breakfast, you will start your trip from Shanghai Museum, one of the top four museums in China. Then head to the ancient Yu Garden, where you can see traditional Chinese architecture, beautiful artificial hills and ponds. We will leave you some free time there to explore the surrounding Yu Bazaar. Around noon, you will enjoy an a la carte farewell lunch (valued at CNY120.00 per person and included in our price) at a popular local restaurant. Your afternoon trip will begin with a walk in the Former French Concession. Afterwards, you will be transferred to the city's landmark site, the Bund, and take a one-hour cruise tour along the Huangpu River - the mother river of Shanghai. As the symbol and a microcosm of the city, the river has witnessed the glory, humiliation, despair and prosperity of Shanghai. After the whole day of sightseeing, our guide will transfer you back to the hotel and bid farewell to you. Today you will check out of your hotel after breakfast, and find your own way to the airport according to your flight schedule. We will be of your assistance at any time you need. Wish you a nice journey home! Very impressed with the service we have received and in particular speedy responses to questions we have raised. We are looking forward to our tour and from the level of service received to date anticipate having a wonderful time. I have no real negative comments to make. As to the meals I found them unlike the Chinese meals here in the US. This was a little surprising but not in a bad way. Personally I like to try most different foods (I have eaten insects in Thailand). All of the meals were quite tasty and there was always lots. A minor criticism was that most of the time the rice was served just before the desert and most people would have liked it to have been served at the beginning of the meal. I believe it is an Asian and Western cultural difference. The only other slightly negative comment about the food was the Peking Duck. Most of our group found it to be greasy. I have eaten duck before and I had a similar dish after the tour in Shanghai which I feel was less greasy and actually presented better ( it was carved at the table). As far as one meal to recommend I have the opposite reaction. I have only one part of one meal not to recommend, that is the Peking duck. The guides were most interesting. If I had to pick a best one it would be the guide in Guilin (Rebecca) would be my choice. I felt comfortable from the very beginning with her. All the guides were conscientious and knowledgeable. The transportation was great. One of my worries about an escorted tour was not being able to be comfortable while riding. I am rather big (6' 2 at 280 pounds) and usually find leg room on buses to be lacking. The size of the tour allowed us all to take up two seats if we wanted. There were several buses which had enough room for my legs without having to take up two seats. The drivers were great with very good attitudes. I have driven some large vehicles in my day and I was impressed with the ease the drivers appeared to maneuver those large busses in tight spaces. I also must congratulate Linda personally. I had many questions before the trip which she skillfully answered. It was a very nice experience to be able to meet her in person. It was a wonderful China trip. We enjoyed it very much. All the guides were excellent. They were always on time, knowledgeable and eager to take care of what we need. They were dedicated and enjoyed what they are doing. It was extremely helpful when they assisted in our check-ins on every in-country flight. Candy, Lily, Lucy, Snow, Jerry and Jandy were all excellent and should be commended. Candy waited over 2 hours at the arrival area, Beijing airport, for our first group due to a lost baggage. Lily's personality and enthusiasm were delightful. All the drivers were excellent, courteous and professional at all times. They ably navigated through the traffic safely. The vehicles/vans were in excellent condition and bottled water was always available. Tour guide in Xian was outstanding, her style of guiding allowed everyone to hear the information. The planning of the trip was also good, as she took into account the old and the child in our group with slow and comfortable pace. Her knowledge of the area and command of English is commendable. We will highly recommend her to other travellers. David and Roberta J. M.
My wife and I are very happy with our experience. It really could not have been a better itinerary for the 18 days we were in China, including the extra days we spent in Beijing before the journey began. We appreciate the help of this company in making all the arrangements that resulted in such a pleasant and memorable time for us to visit China and to learn more about the great people, places, and food. The meals were spectacular in general. We appreciate the wide spectrum of regional dishes. 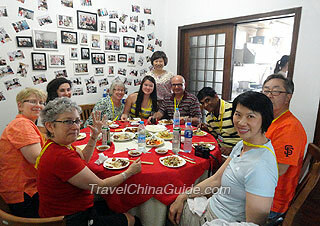 The guides chose very well to give us a pleasant balance of tasty choices at each meal. The restaurants were all excellent, and appropriate to each city. It is difficult to choose just one to recommend because they were so different in ethnic dishes. The Beijing Duck and the dumpling dinner in Xian are the first that I can quickly recall as being very different, but all were enjoyable. We also recommend the Hot Pot dinner in Shanghai that we found on our night on our own. If you change the itinerary to include dinner in Shanghai, we recommend you include a Hot Pot dinner. The guides were all terrific. My wife and I both agree that we have never been on a trip where the guides have been as consistently outstanding as they were. All of the guides spoke good to outstanding English. We never had a problem communicating with them. They understood everything we said, and we understood them just fine. All of the guides were highly knowledgeable about their cities or places we visited with them. We were highly impressed with their backgrounds, their training, and their ability to express their knowledge in easily understandable English. It really made the trip very pleasant to be guided by such professionals. They were clearly interested in their work, and proud of their cities, and wonderfully forthright in answering our many questions. They should be commended for their patience and courtesy to foreigners. The cars were clean and big enough for our needs, and the drivers were courteous and professional and careful generally. Getting used to the driving style in China compared to the US took a few days, but we were sometimes warned when not to look out the front windows! We were well informed of what to expect and we got exactly what we were told we would have. It was just like the best American tours! We loved everything that the tour brought to us! China was full of never ending surprises made all the time enjoyable by our excellent tour guides, and the drivers, too provided outstanding level of service! This was an amazing trip and so well planned. The guides were all fluent, knowledgeable and extremely helpful. Many of our meals were included in the package and they were all amazing and different - we especially enjoyed the Sichuan food! We were able to see everything we wanted and saw things which were completely new to us. We would especially like to thank Linda in Beijing, Effie (Ping) in Guilin, Tracy in Chengdu and Kris in Shanghai for being so amazing with us! We would not hesitate to recommend this company as everything was amazing and I look forward to travelling with them in the near future. What a holiday! It was fantastic. We did and saw so much on our stops, and have now returned home with many great memories. The Chinese meals arranged for us were just what we had hoped and wanted. All were different in their own way, some being spicy, some being sweet, and varying from area to area. We found it impossible to say that one was any better than the others. One suggestion - It would have been good if our guides could have sat down and eaten with us. Not only would this have been good socially, but we would have benefited from learning about what we were eating, and indeed how best to eat it (i.e. using chopsticks!). All our guides were great, with perhaps Echo not being quite as good as the rest. Their command of the English language was good, local knowledge very good, and attitude excellent in that they went out of their way to be flexible and accommodate the needs and preferences of our group. All our transport was absolutely fine, and congratulations must go to all the drivers for coping so well with the Chinese traffic! Hello Im Dominican and ill be flying from JFK to Osaka with a 4 hour Layover in Beijing. Would i need to apply for a visa or can I get a 24-hour transit permit? No, you don't need a visa. You can enjoy the 24 hours visa free policy because of your stopover is only 4 hours. what subway route to Marriott Fairfield Jingan? What would taxicab fare to the Marriott cost from Longyang? Take metro line 2 from Longyang Road to People's Square Station, and then transfer to metro line 1 to Yanchang Road Station, Exit 3. Afterwards, walk north around 600 meters to find the hotel. Is there a good app you recommend for navigation? In Mainland China, Google map dose not work but we mainly use the Baidu Map or Gaoge Map. Are tours to the great wall impacted by weather events such as the recent cold? The recent cold will not impact on the visit to the Great Wall. Since it is chilly and windy in December, I suggest you wear layers and take comfortable shoes. If you are lucky, you may see the amazing snow-covered landscape of the wall. Can I use 2 144 hour visas in Beijing?l in a short period? I have a round trip flight from Portland Oregon to PEK. Now I’m spending the first 5 days in PEKthen off to Tokyo then Tokyo to Seoul. Then I return back to PEK from Seoul where I’ll spend 2 more days in PEK before my flight back to Portland. Will this be allowed? Yes, you can use. But remember to book the interline tickets in advance and you can only be allowed to move in Beijing, Hebei, Tianjin during your stay in China.